As seen on HGTV's Ellen's Design Challenge, Season 2! 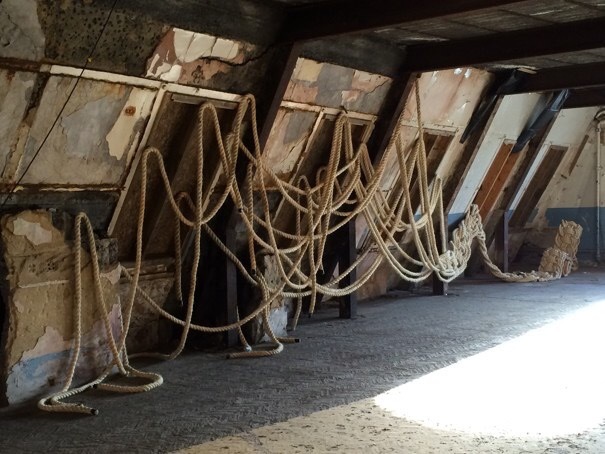 300 metres of Sisal rope, epoxy resin. Resin sponsorship by Whitten Timber, London. 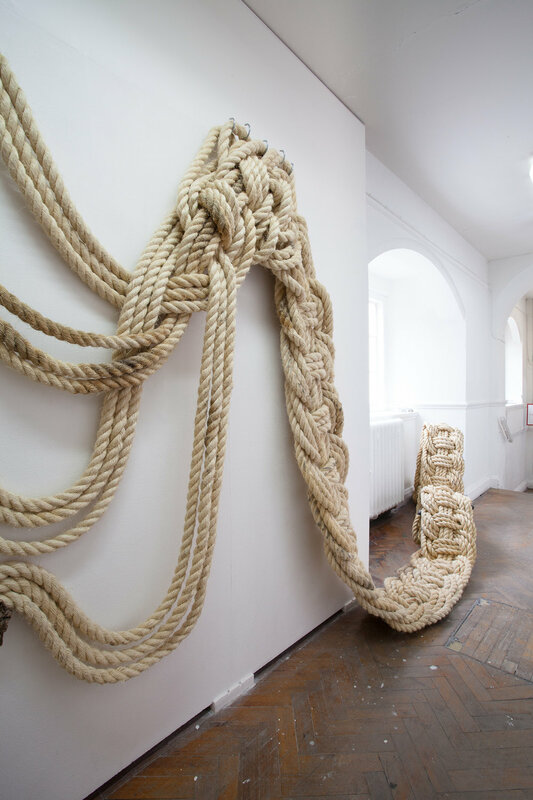 Entire installation weighs 780 pounds. 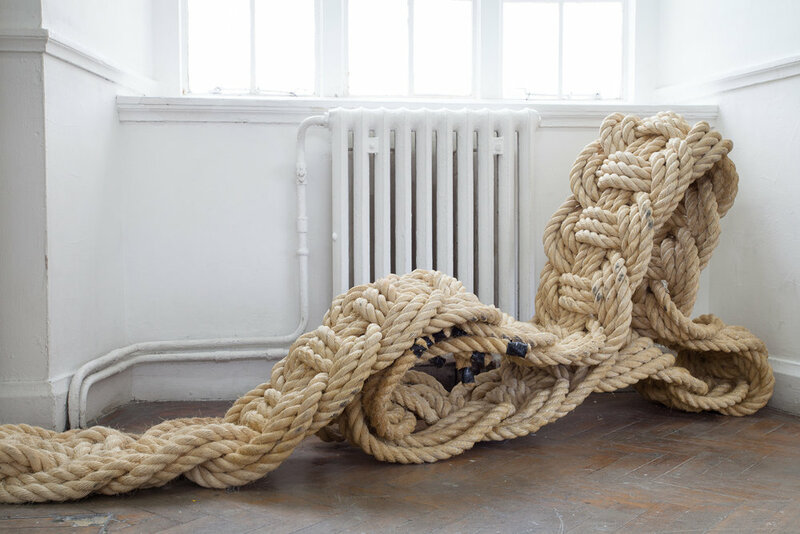 The installation’s title—Apotropaic—consists of three primary visual elements: 300 continuous meters of Sisal rope, bronze cast knots and a functional lounge chair made of rope. Since 2012, I have maintained a list of words that have sent me to the dictionary; the impetus for the design, materials used and overall installation of Apotropaic comes from that list. Loosely defined as a verb, meaning ‘to ward away evil’, apotropaic practices have been practiced by a variety of historic cultures. Knots were once employed as apotropaic devices; the more intricate or complex the knot, the more power it held (think of Celtic designs). The bronze knot fixtures within Apotropaicalter the scale, standing as sculptural objects on their own. 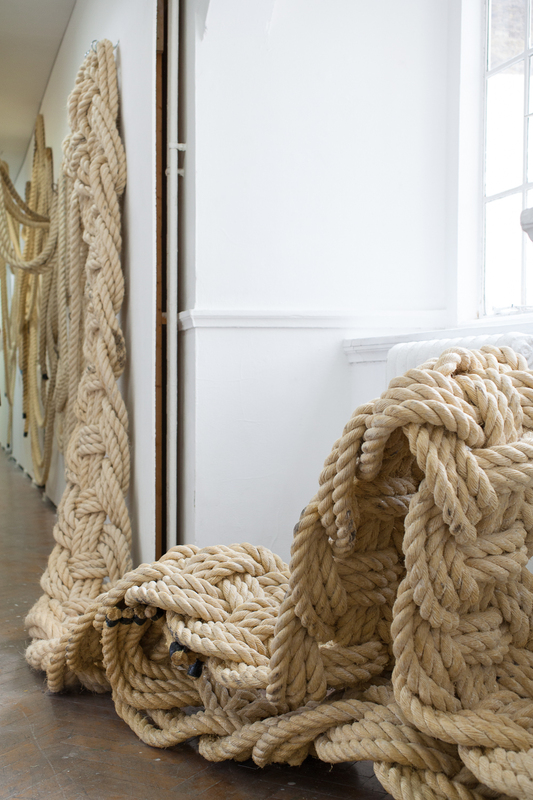 They stand as signposts for the directional movement of the larger rope piece. The placement of this installation, in a corridor, highlights the processional element of the drawing. Similar to that of one’s journey up the acropolis, toward the Parthenon, the spatial experience leads an individual from the beginning of the corridor to the end, preparing oneself for what awaits them at the work's culmination.. 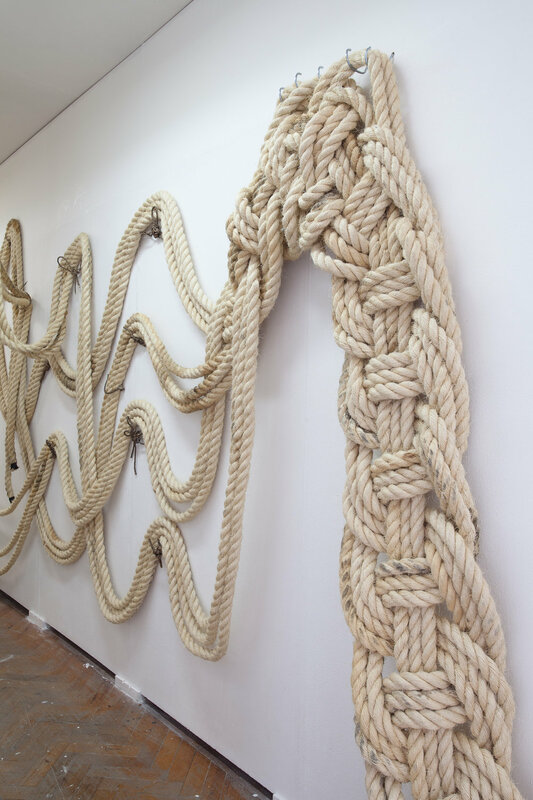 These initial rope strands function as drawings along the wall, culminating – at the far end – into a continuous braid which wraps itself into a functional lounge chair. Apotropaic is a design drawing that has come to life, visually, and as a spatial experience. A huge thank you to Whitten Timber, London for sponsorship by their contribution of Resin to make this piece happen! © 2018 Cristin McKenzie Gibson & McKenzie Gibson Limited. All rights reserved.